With an increase in people taking selfies, reports suggest that many people are now seeking dental work to perfect their smile. I recently read an article in the Telegraph that dentist are seeing a huge rise in patients who take selfies seeking treatment to perfect their smile. The report suggests that many patients who take selfies wish to have a reduction in the dominance of their natural teeth. The report also states that surgeons are having to stop several people a week from undergoing unnecessary treatment, as in real life their teeth look fine. A selfie is a photograph that one has taken of oneself, typically one taken with a smartphone and shared via social media. Nowadays many people take selfies and as a result people want to look their best in these photographs. Therefore, it appears that people are getting a false impression of what their actual teeth look like and are being too hasty about seeking cosmetic dentistry. 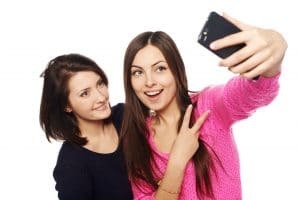 There has been a rise in cosmetic dentistry and with selfies becoming a part of modern day living, it is understandable that people will want to achieve the perfect smile in their selfie snap. Cosmetic dentistry treatments include orthodontic work such as ‘Invisalign’ braces (invisible braces to realign the teeth), crowns, veneers and teeth whitening through bleaching. However, cosmetic dentistry is not without its dangers and cosmetic treatment can result in the unnecessary damage of perfectly healthy teeth. This can mean more treatment, more expense, and an eventual outcome which may not match a patient’s original aesthetic requirements. My colleague Jessica Watson has written a previous blog on our website, when cosmetic dentistry goes wrong. This blog highlights the problems that people can encounter after having cosmetic dentistry. Therefore, people should think hard before rushing into cosmetic dentistry to achieve the perfect smile for their next selfie. If you wish to discuss a potential enquiry with us regarding poor cosmetic treatment. Please feel free to contact the Dental Negligence Team and we will be happy to assist you and provide you with our initial advice.